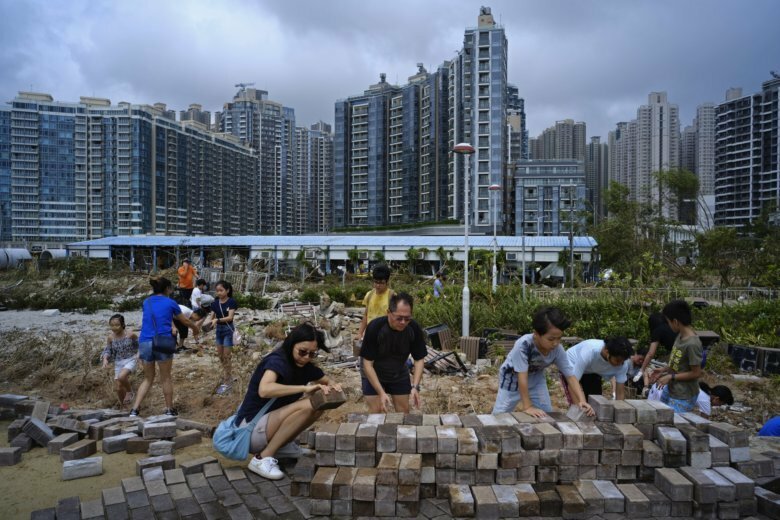 Life is gradually returning to normal along the hard-hit southern Chinese coast, where high-rises swayed, coastal hotels flooded and windows were blown out as a result of Typhoon Mangkhut. In Hong Kong on Monday, crews were clearing fallen trees and other wreckage left when the financial hub felt the full brunt of the storm on Sunday. Authorities have reported four deaths from falling trees and building materials in Guangdong, China’s manufacturing hub. At least 65 people died when the storm swept through the northern Philippines over the weekend before lashing southern China. A Philippine mayor says it’s highly unlikely any of the 40 to 50 people who are feared buried in a huge mudslide set off by Typhoon Mangkhut can be found alive. Palangdan says rescuers have dug out 11 bodies from a muddy mound covering a former miners’ bunkhouse which had been turned into a chapel. Dozens of residents sought shelter there during the storm Saturday despite warnings it was dangerous. Hundreds of rescuers, including police and soldiers, scrambled to search for the missing as grief-stricken relatives waited nearby, many of them quietly praying. The Philippine government has ordered a stop to all illegal mining in six mountainous northern provinces in a drastic decision to prevent more tragedies after Typhoon Mangkhut set off landslides that trapped dozens of poor people, including small-scale miners. Environmental Secretary Roy Cimatu announced the ban during a news conference Monday in Benguet province, where 54 of the 65 typhoon deaths in the Philippines occurred. Mangkhut hit the Philippines on Saturday and Hong Kong on Sunday before weakening to a tropical storm Monday in inland China, where four have died. Cimatu said army troops and police would be deployed to enforce the ban, which covers about 10,000 small miners in Benguet’s Itogon town, where dozens of poor miners and their families were feared buried by a landslide. Philippine and Chinese authorities say the death toll from a typhoon has risen to at least 69 with dozens missing. Mangkhut weakened to a tropical storm Monday morning as it moved deeper into southern China, where rain and strong winds were expected to continue through Tuesday. A Philippine national police report said the death toll as of Monday midday was 65, with 43 people missing and 64 injured. Chinese authorities reported four deaths from falling trees and building materials in Guangdong, China’s manufacturing hub. Many of the missing in the Philippines are gold miners and their families feared buried in a landslide after seeking shelter in a bunkhouse-turned-chapel in a village in Benguet province. Mangkhut battered the northern Philippines on Saturday before slamming into southern China on Sunday. It was the most powerful typhoon to hit Hong Kong since 1979, packing winds of 195 kilometers per hour (121 mph). Mangkhut has weakened from a typhoon to a tropical storm as it moves deeper into China. The storm was still affecting southern China’s coast and the provinces of Guangdong, Guangxi and Hainan on Monday morning and rain and strong winds were expected to continue through Tuesday. Hong Kong residents were being told to stay away from the coastline and be on alert for occasional gales. Bus, ferry and rail services were suspended and almost 900 flights were canceled at the city’s airport, one of the world’s busiest. The South China Morning Post said Hong Kong’s hospitals had to use backup power due to outages caused by the storm. Mangkhut earlier lashed the Philippines, sparking landslides and building collapses that killed at least 64 people. At least two deaths have been reported in China. As of Monday morning Mangkhut was on track to pass over the Guangxi regional capital of Nanning. The Hong Kong Observatory reported Mangkhut was the most powerful cyclone to hit the city since 1979, packing maximum sustained gusts of 195 kilometers per hour (121 mph). Rescuers are resuming work to find people feared trapped by a landslide in a Philippine gold-mining area that was pounded by wind and rain from Typhoon Mangkhut. The workers used pikes and shovels to dig into the mud Monday morning, with the use of heavy equipment limited on the soaked ground. Philippine police had said earlier that at least 40 people, mostly gold miners, were feared to have been trapped when part of a mountain slope collapsed on miners’ bunkhouses in a far-flung village of Itogon town in Benguet province. At least seven bodies had been dug out Sunday before the work had ceased during the night. Mangkhut battered the northern Philippines on Saturday before slamming into southern China. At least 64 deaths were reported in the Philippines and two more in China as of Sunday.